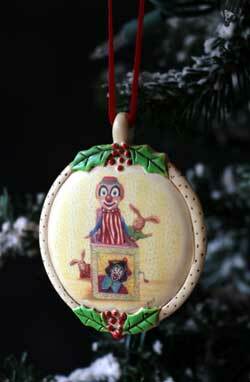 Drumming Monkey Ornament, by Demdaco. A beautiful reproduction of artist Rachel Badeau's hand-colored, embossed, and engraved ornaments, inspired by scrimshaw techniques and her passion for animals. This ornament features a monkey drumming along with some rabbits, and is accented with holly leaves and berries, and hangs from a red ribbon. Measures 2.5 inches in diameter. Makes a great gift! Resin. Skating Pig Ornament, by Demdaco. A beautiful reproduction of artist Rachel Badeau's hand-colored, embossed, and engraved ornaments, inspired by scrimshaw techniques and her passion for animals. 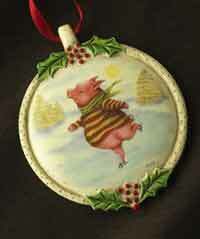 This ornament features an ice skating pig, and is accented with holly leaves and berries, and hangs from a red ribbon. Measures 2.5 inches in diameter. Makes a great gift! Resin.